Unreal Lawns supply and install artificial grass in Royton and the north west of England. We serve domestic and commercial customers in the area, with products suitable for a wide range of applications from outdoor spaces and gardens, to event areas, exhibition space and more. See below for some examples of projects we've carried out in the Royton area. Lovely green lawns add beauty to your home, but unfortunately most people do not have the time to achieve them. This was a problem for a young professional couple from Royton, Oldham, who both have busy lives due to work commitments. They had moved into a new house so at first the lawn looked great, but after a while this can change and they were starting to get frustrated about not having the time to keep it looking as it did when they first moved in. 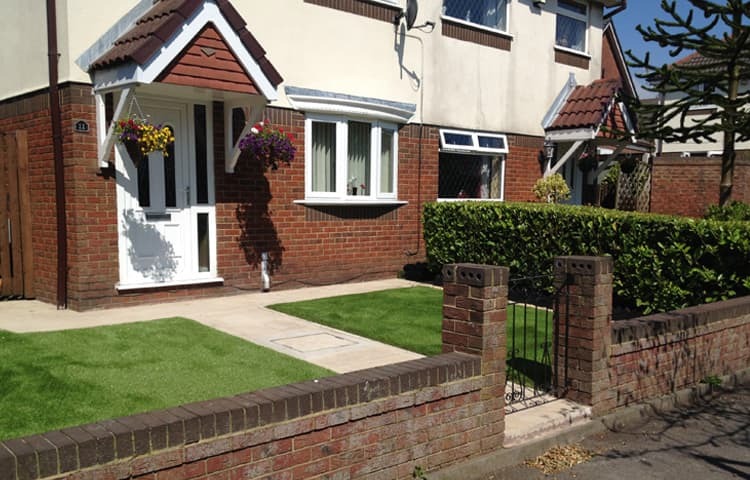 Unreal Lawns suggested the use of our supreme artificial grass as a solution. This product is a nice vibrant green whilst still looking like natural grass, so your garden can look fantastic all year round, and is great for those who struggle to find time to keep their garden up together. As well as looking great, installing artificial grass at your home provides a cost saving in the long term as it does not require maintenance such as cutting, watering or re-seeding.